The Fed signaled four likely rate increases this year, instead of only three, and this is likely to have a meaningful impact on the yield curve and specific sectors of the market, Oppenheimer's Ari Wald recently explained on our Financial Sense Newhour podcast. The short end of the yield curve — which is more correlated to Fed policy — will continue to rise and, in turn, we’ll continue to see the yield curve flatten. “If we examine the relationship between the yield curve and the value-versus-growth relative relationship, it's been very closely correlated in recent years,” Wald said. The recent strength we’ve seen in the dollar is going to hurt investors who own dollar-denominated ETFs that track both developed overseas markets and emerging markets. 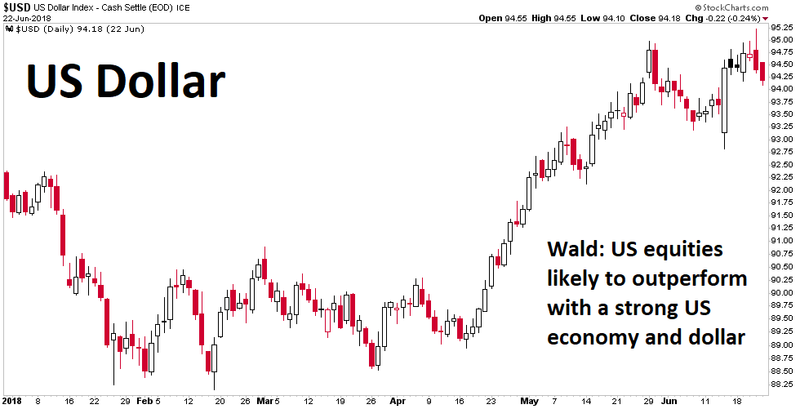 We’re likely to see U.S. outperformance, Wald noted, both in local currency terms and dollar-denominated terms. This argues for investing in the U.S. rather than overseas equities, he added. Consumer discretionary is also doing surprisingly well overall, both in cap-weighted and equal-weighted segments. This area of the market had been an underperformer from 2015 to 2017 and is really taking a noticeable leg up with traditional retailers such as Macy’s and Home Depot, in particular, leading the way. Though we’re seeing signs of late cycle market action, this doesn’t mean equities are a bad bet here. The trick is likely to be picking the right index, or picking individual stocks here. At some point, we will see the yield curve invert, Wald noted, which usually means a recession is around a year away, but he noted that we’re not there yet and it does us no good to try to lead the leading indicator. With the advance-decline line at a new high and with small caps at a new high, Wald noted, this argues against a market top forming without the inversion in the yield curve, and for below average recession risks.